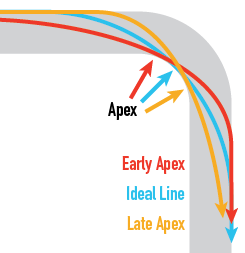 To discuss cornering any further, we need to understand the concept of hitting an apex. We’ll start to visualize the ideal race line and explore the effects of early and late turn-in. 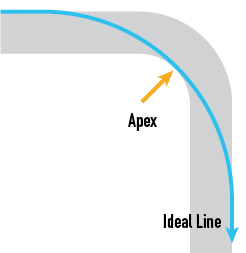 In racing, the apex of a turn is the geometric center of the inside of the curve. Hitting the apex means taking your turn as to cross as closely to that point as possible. You can carry more speed through a wide corner than a narrow one. That’s why a traditional racing line is “out-in-out”. Begin on the outside of the turn, move toward the inside to hit the apex, and move back to the outside as you exit. 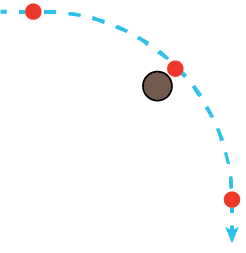 Geometrically speaking, this is the best way to conserve and carry momentum, because it increases your turn radius as much as possible. If you hit the corner before or after the geometric center, it’s referred to as an early or late apex. Beginners frequently early-apex their corners; it’s natural for many to start turning in as soon as it approaches. Turning in too early and too shallow like this is problematic. 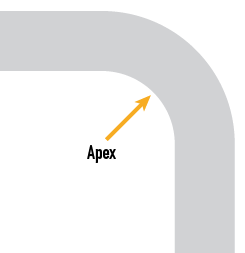 First, you fail to maintain a wider radius—after you pass the apex you need to turn tighter to stay on course. Second, you’re robbed of extremely valuable exit speed—the slowest, tightest part of your turn happens when you’ve almost completed it. It’s more difficult to find the apex and the ideal line when you approach a corner than you might think. This exercise will show you how you are seeing the corners relative to how they actually exist in space. 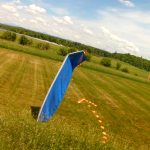 Set up a course with several distinct turns separated by straights, and fly around it as best you can. Record your flight for later review. Afterward, walk the course while carrying an additional set of markers. At each corner, place a marker at the apex. Then, place a marker on the outside edge of the course before and after each turn at the point that gives you the widest radius through each marker. 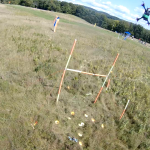 Fly the course again, this time trying to flying directly over the entry, apex, and exit markers you laid out. Do this several times until you hit each corner above these markers, reducing your speed if you need to in order to do it accurately. Record this flight as well. Finally, remove the entry/apex/exit markers and fly again, trying to hit these points by memory. When you return home, review your flights. 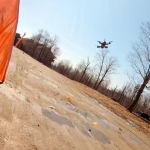 You should be able to determine what your natural tendency is in approaching a corner by looking at the difference between your first flight and your best flight over the markers. This will show you what you need to work on. 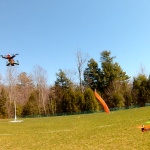 By reviewing the difference between your flight over the markers and the one afterward, you can see how far you’ve drifted off the line. If you have trouble finding the correct placement for the early and late markers, try first drawing a map to scale. Google Maps can be a useful tool for this, allowing you to draw right on a satellite image. Next up, we’re going to explore how, when, and why you’ll want to prioritize exit speed.